Meh. One thing my typist and I both share is an appalling lack of concern over our respective birthdays. But today's date is important. 20 July, 1969 is when Neil Armstrong and Buzz Aldrin landed on the moon. Roll the words around in your head a moment. Landed. On. The moon. It's important to me because that's where I grew up. Not the moon but more or less right next door. My father was one of thousands of civilian contractors who worked at KSC, or as it's more popularly known, Cape Kennedy. Merritt Island, Florida was essentially the on ramp that lead to the moon. Many of you watched the launch on television, I watched from the roof of out house about 17 miles from Launch Complex 39A...."
In honor of the 40th Anniversary of Apollo 11 [July 16 - 24, 1969], here are two excerpts from episode 6 of the HBO mini-series "From The Earth To The Moon"
While visiting the Space Frontier sim for the Apollo-Saturn V adventure on Monday July 13th, I had the pleasure of meeting builder Ryder Spearmann. I knew his name from Trek Works building various sci-fi related items such as the very detailed Classic Enterprise Bridge from Star Trek. 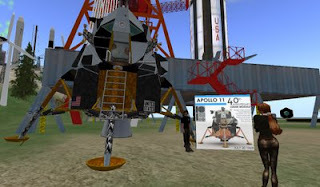 Lately, Ryder is using his fantastic building skills creating RL spacecraft in SL such as this beautifully built Lunar Module. I think a Command/Service Module may be next on his agenda. "Two of you will be first"
In honor of the 40th Anniversary of Apollo 11. [July 16 - 24, 1969]. Here is an excerpt from episode 1 of the HBO mini-series "From The Earth To The Moon"
"...I do know that the first man to walk on the moon walked into this room today and he's looking at me right now..."
Gemini 8 flight from episode 1 of "From The Earth To The Moon"
Gemini 4 flight from episode 1 of "From The Earth To The Moon"
Freedom 7 flight from episode 1 of "From The Earth To The Moon"
Y'know? It's hard to imagine a world without YouTube now. There's something for everyone. Shortly after launch on November 14, 1969, Apollo 12 was hit by lightning, leaving rookie astronaut Al Bean to save the day. A fragment from the miniseries "From the Earth to the Moon"
Apollo 12 lightning-induced problem shortly after liftoff. 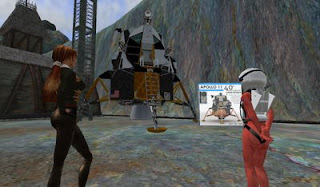 Taken from the documentary "Failure Is Not An Option"
from dadenmedia: "This video shows a simulation of Tranquility Base built in Second Life by Linden Lab Gold Partner Daden Limited. 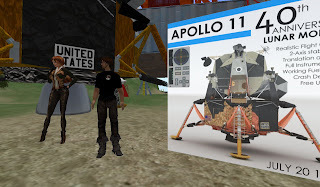 As well as featuring a model of the Lunar Lander the simulation features a map overlay at 1:1 scale showing where the astronauts walked, and hotspots that shows the images and video in a HUD that were taken by the astronauts from the places they were made. 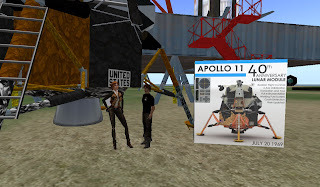 The science experiments are also in their correct places and link back to web pages providing more information...."
In honor of the 40th Anniversary of Apollo 11 [July 16 - 24, 1969], I setup two excerpt videos from episode 6 of the HBO mini-series "From The Earth To The Moon"
Prokofy Neva has a new FIC 2.6 and Noosphere list posted and it got me thinking of my own list. So I'd like to announce FOZ 1.0. This is a list of people in Second Life who have been good friends, an influence or source of advice in some manner, and a real and consistent asset to me from January through June 2009. The list is a snapshot of that time frame and I'm sure will change as time marches on. Some people will know why they are mentioned. Others may be surprised to be listed, but in some small way they contributed to my sanity in SL. If you're not on this list, and think you should be...don't feel hurt. This is version 1.0 and will change over time. I tried to think of an enemies list (EOZ = Enemies of Zoe) but to be honest I couldn't think of anyone who deserved to be listed. I'm no good at sustaining grudges. 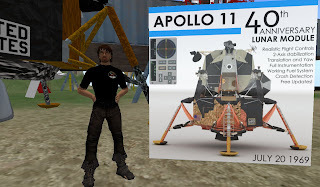 In honor of the 40th Anniversary of Apollo 11. Here is an excerpt from episode 6 of the HBO mini-series "From The Earth To The Moon"
A Stroll Through Caledon: Steelhead Goes Tiny for the Dogfights! They're both cute and fierce!...and...CUTE!